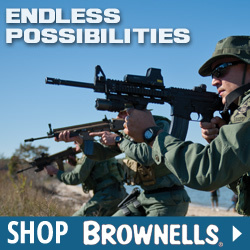 We found a great deal on the Smith Enterprise Ar-15 Vortex G6-A3 Flash Eliminator 22 Cal for only $59.99 at Brownells. Four, specially angled flutes hide nearly 100% of muzzle flash, even during full-auto fire, by dissipating gas and retaining unburned powder for increased residual burn. Constructed of the same 8620 bar stock steel used in the manufacture of AR-15/M16 bolts and carriers, then case-hardened to provide a high-strength core and tough, outer shell. Special, helix design helps align exiting barrel gas to improve accuracy with all bullet types. Skirt extension conceals gap between barrel shoulder and flash hider on AR-15, M16, and M4 rifles. 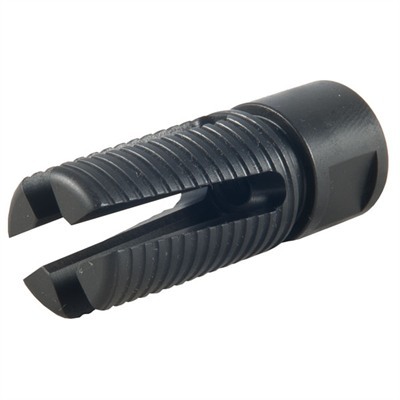 Grooved base ring allows integration of Blank Firing Attachment (BFA) used by law enforcement trainers, and permits installation of the Smith Enterpris Mfg: Smith Enterprise SPECS: 8620 steel, Parkerized, black, matte finish. 1/2″-28 tpi. 2.31″ (5.9cm) long, .858″ (22mm) dia. 3.1 oz. (88 g) weight. Fits AR-15, M16, and M4.